In this sequel to WATER WALKERS at the Nakoda Hills Swim Club, a nasty fall lands the elderly Lindsay Morgan in the hospital. Undergoing rehab, she relays to her friend, Megan O’Dwyer, tales of the winter escapades of her summer cohorts as they move on from the Nakoda Hills Swim Club. The gals - Lindsay, Theresa, Leslie, and Lucinda - meet some interesting characters at the indoor pool at Pinnacle Health Club. They include Johnny, a local police chief; Rick, a retired teacher; a retired general, Richard Sware; and Phil, the lifeguard. 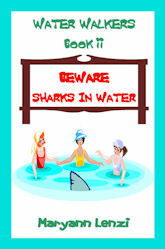 In Water Walkers Book ii Beware Sharks In Water, the camaraderie of the summer quickly begins to fizzle as questions arise about some of the original women. There is Theresa’s new job working for a high government official, and Nurse Leslie’s position running one of Theresa’s many companies, which both raise eyebrows. Intrigue and suspense follow as Lindsay and her new friends begin an investigation into some suddenly strange goings on at Theresa’s ranch. Meanwhile, Lucinda’s home life begins to fall apart, pulling her into the middle of some odd twists and turns. Come, water walk with Lindsay and her friends for a second time. Find out if there really are sharks in the water. See whether the friendships survive the test of winter. Copyright © 2001 - 2012 by Beaver Publications, Inc.